Bossy Italian Wife : My Oven's Broke...No-Bake Cookies It Is! My oven has never been broken before. Of course the SECOND I realized it was broken, I wanted to bake everything. Funny how that works, right? Lucky for me the very day I came home to a broken oven was also the day I purchased these great no-bake healthy fudge bites. Which got my brain ticking when it came to "no baking." These were the inspiration behind the no-bake cookies. Lucky for me, my oven was fixed just a few days later at which time I began furiously baking anything that would fit in my oven. This went on for several days....but before it was fixed, and before I baked like a mad-woman, I made these no bake cookies and they were awesome! I also believe these cookies to be generally healthy. Yes, I did add some cocoa puffs to these cookies....but generally, I don't buy cocoa puffs, so maybe I was high on the cocoa goodness. You could substitute anything for the cocoa puffs...like Trix. Just kidding! You could sub some nuts or extra coconut, or chocolate chips, or granola. Whatever you like. I found THIS RECIPE and then I adapted it. Part of that adaptation included using raw honey that I had bought at the store. I am not lying when I say that this is the ACTUAL moment I found out that raw honey was more of a solid than a liquid. I had no idea. I also learned that it is sweeter than regular honey... 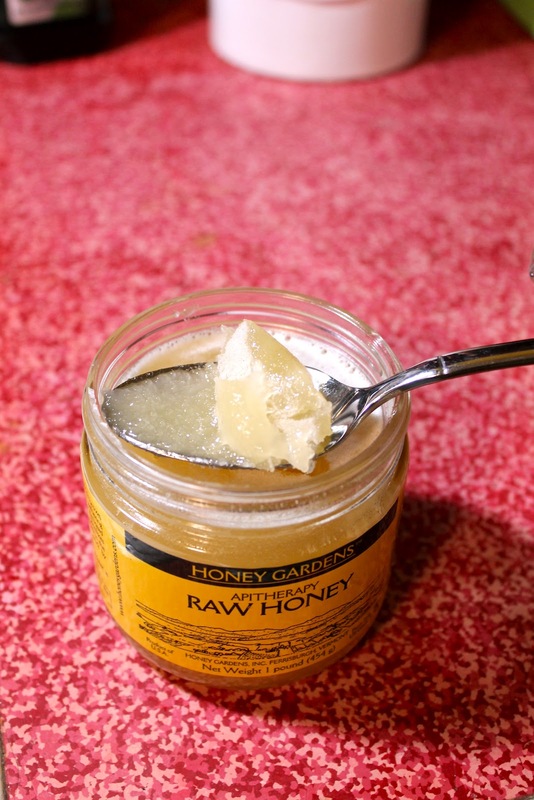 Raw honey and I are sort of in love now. Peanut butter. Okay, this might sound dense, but I never made the connection that peanut butter was a "nut butter." Like almond butter... why didn't I make this connection? I don't know. But I didn't. This is also coming from the same person who can't melt chocolate in the microwave, so I guess it's not a huge surprise. So you put in a pan and on medium low heat, you heat the raw honey [which is solid] and peanut butter [which is a nut butter!] until they get melty. 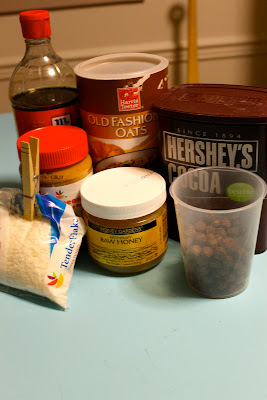 Then I mixed my dry ingredients... some coconut, oatmeal, and just for kicks, some cocoa puffs. See how it gets all melty? YUM! Then add your dry ingredients. And VIOLA! I was surprised at how well these really turned out. Then roll them into balls. They didn't last long... maybe you should make a double batch. In a small saucepan, heat the peanut butter and raw honey over medium low heat until smooth and melty. 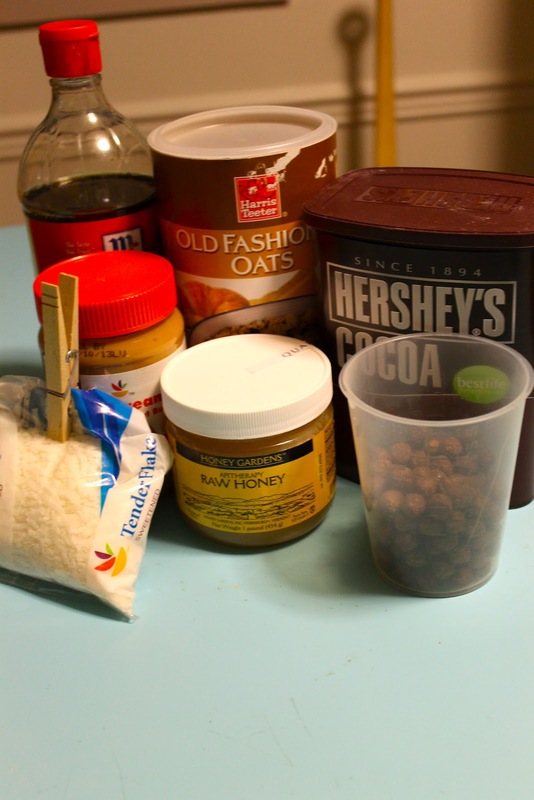 Add vanilla extract and cocoa powder and mix entirely. 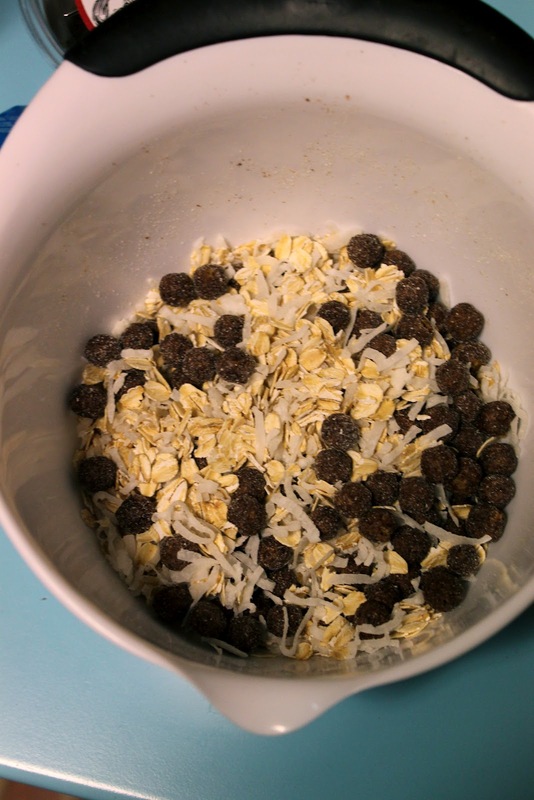 Add in the rolled oats, coconut flakes and cocoa puffs. Mix until fully blended. Put in the refrigerator until chilled, about 20 minutes. Remove the chilled "dough" from the fridge and roll into small balls. Store at room temperature or in the fridge--whichever you prefer. Makes about 22 cookie balls. Best no-bake cookie recipe ever! It was delish! Thanks for posting this, so glad a googled before going through the hassle of my old recipe or going out to buy store bought cookies! So glad you enjoyed them!! I am a big google fanatic myself!! Happy Thanksgiving!